Tasty waves and good times are guaranteed to come standard on this official towboat of the World Wakesurfing Championship – Packed with all of the performance features professional wakesurfers have come to expect, this Centurion Enzo SV233 boasts over 4000 lb. of ballast, articulating tracking fin and asymmetrical surf tab for dialing in that PERFECT wave shape & size. A 4000 WATT Wetsounds audio system will keep your heads bobbing behind the boat! You can bring your favorite playlist and stream it directly from your mobile device via Bluetooth. We’re also equipped with tower-mounted lights and blue LEDs throughout and under the boat for killer sunset surf sessions! This Centurion also comes with (2) heater tubes & heater blanket to keep you warm during those cooler evenings on the water. Wakesurf boards from The Walker Project and other vendors are available for use. The bimini top goes up in minutes to keep you protected from the sun. 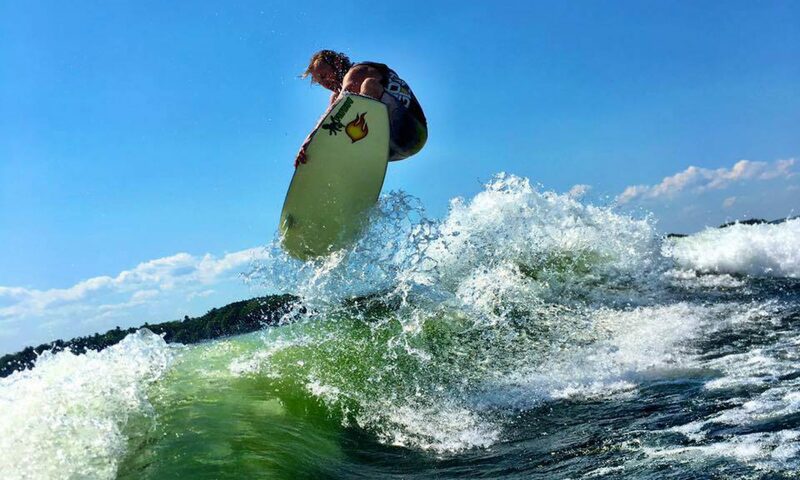 There’s no option missing on this wakesurf machine! As they say in the industry, ‘there’s no replacement for displacement’ and that holds true for this PCM-powered 409 horsepower surf machine!